Each UFU president has an opportunity to select a charity for the UFU to support during his/her two year term. Throughout the President's two years UFU staff and members have the opportunity to raise funds for the chosen charity via various activities such as coffee mornings, athletic events, quizzes, bake sales or by just simply making a donation. Previous charities supported include: NI Cancer Fund for Children (NICFC), Marie Curie Cancer Care, Rural Support and the MS Society. 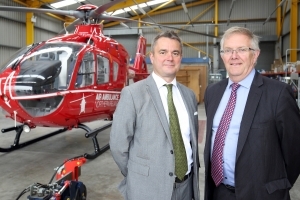 In 2018 the UFU is teaming up with Air Ambulance NI to mark its centenary year. The UFU has various plans to mark 100 years, during which farming has changed dramatically but core issues such as profitability, productivity and succession remain the same. 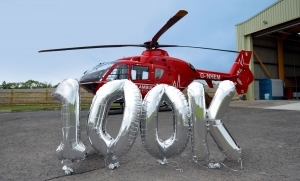 The UFU have a goal to raise £100,000 for Air Ambulance Northern Ireland. In 2008 to mark its 90th Anniversary the Ulster Farmers’ Union launched a fund raising appeal, working in conjunction with the local charity ‘Fields of Life, with the aim of building a new school for deprived children in South Western Uganda. Throughout the year UFU members and staff gave generously and participated in a number of fund raising events which included: the UFU’s cycle for Africa, as well as local table quizzes and BBQ’s. The highlight of the fundraising activities was the UFU Gala dinner, which honoured Northern Ireland’s leading athletes and raised a substantial amount for the fund raising appeal. UFU members and staff raised a staggering £140,000 and September 2009 marked the historic opening of the Ulster Farmers' Primary School in Kyengando (pronounced 'Chen-gando'), South-West Uganda. The new modern school, built with brick walls, a sturdy roof, and painted walls and ceiling, replaced the mud walled structure which was not fit for purpose as the number of pupils attending the school grew. Now, almost 400 primary school children from across the Kiruhura, Kyenjojo, Kyenshebashebe and Rutooma districts now attend the school. Also, as part of the UFU Africa project, a borehole supplying clean water to the village of Kyengando was constructed. The new facilities have transformed the lives of the children in this remote part of East Africa and UFU members and staff should be incredibly proud of their contribution to this project. In fact, UFU members and staff raised enough money not only to build the school and borehole in Kyengando but to also build a second school in the Kiruhura district of South Western Uganda. The Kanyaanya El Shaddai Primary School opened in April 2012. Despite these communities now having modern school buildings there is still a lack of essential educational resources, such as uniforms, text books, pens and pencils, which can greatly hinder learning and teaching. The UFU is proud to continue to show our support for the pupils of the Ulster Farmers’ Union schools by supporting a child sponsorship programme, in conjunction with the charity Fields of Life. UFU members and supporters can sponsor a child for £14 a month which provides a child of primary school age with the opportunity to attend school, a uniform, school equipment, and access to clean water. Not only will you be helping to provide that with child with practical support but you will also be helping them to develop skills that will give them and their families a chance of a better future. For more information or to sponsor a child at the UFU schools contact Fields of Life on 028 38 390395.